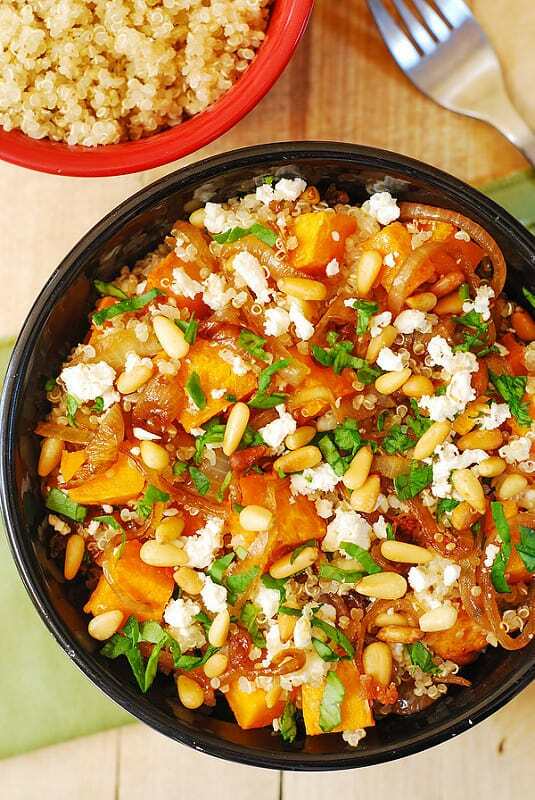 Healthy Quinoa Salad with Roasted Butternut Squash, Pine Nuts, Caramelized Onions and Feta cheese, with French Vinaigrette salad dressing. 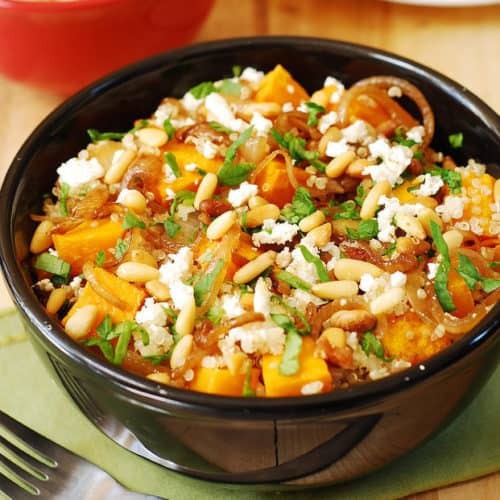 Healthy, vegetarian, meatless, gluten free recipe, packed with anti-oxidants (squash) and protein (quinoa). This delicious quinoa salad is perfect for the Fall and holidays. It will look great on your Thanksgiving, Christmas or New Year’s Eve menu. 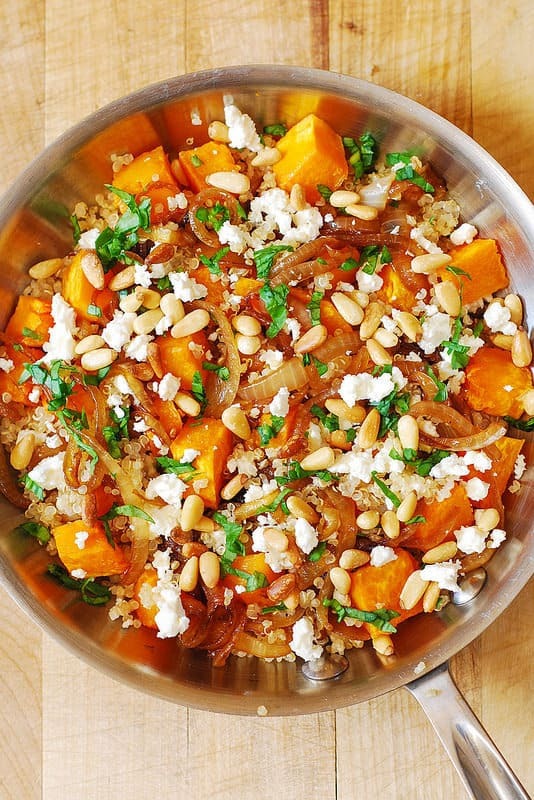 And it’s a great way to use butternut squash a little bit differently than usual. All ingredients match one another really well, and the salad dressing is so good! I’ve been eating this for lunch for days now, and this salad keeps you full and satisfied for a long time. First, you will need to peel the squash, slice it into 3/4 inch cubes and roast it in the oven until soft. 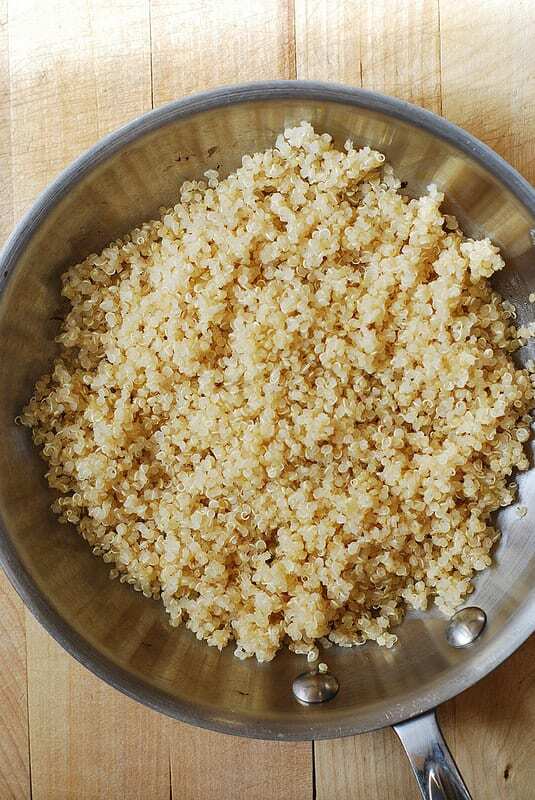 Here is how to make cooked quinoa (what the recipe calls for) easily and quickly. You will only need half of this amount, because 1 cup of uncooked quinoa makes 3 cups of cooked quinoa, and you’ll only need 1 and 1/2 cups of cooked quinoa for this salad. Add 1 cup of uncooked quinoa, 1/4 teaspoon of salt and 2 cups of water to a large sauce pan. Bring to boil. Reduce to medium simmer and cook, covered, for about 20 minutes. Remove from heat, stir the quinoa with the spoon. Cover the pan with lid, and let the quinoa rest in the pan for about 10 minutes. Yield: 1 cup of uncooked quinoa yields 3 cups of cooked quinoa. By the way, for dressing I highly recommend Brianna’s French Vinaigrette salad dressing. That’s what I’ve used with this salad, and it’s perfect! The dressing is budget friendly, and you can buy it at Walmart. It’s all natural ingredients, it’s gluten free, no high fructose corn syrup, no added MSG. And, most importantly, it tastes so good! Or, use a similar dressing. Or, make your own, using this recipe for French Vinaigrette Salad Dressing. Preheat the oven to 400 F. Line the baking sheet with aluminum foil and grease with 1 tablespoon of olive oil. Peel the squash and slice it into 3/4 inch cubes. You will only need 1/2 of the medium size squash. 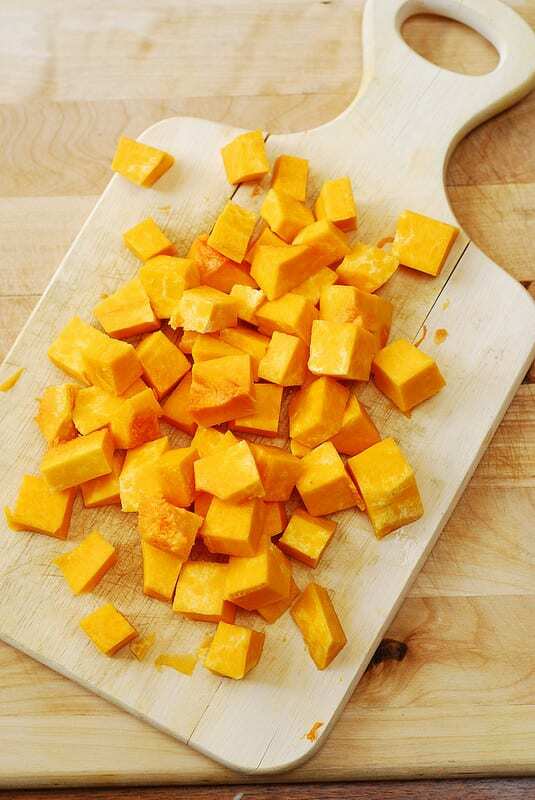 Toss the squash cubes in a large bowl with 2 tablespoons olive oil and generously sprinkle with salt. Put butternut squash on the greased baking sheet and roast for about 30 minutes, until soft. Flip the squash cubes over midway through baking. Let it cool slightly before adding to the salad. 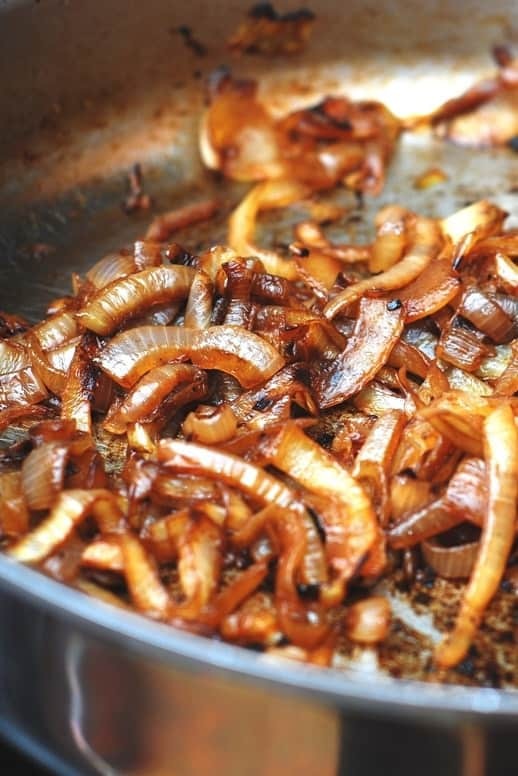 Caramelize onions according to the instructions here. 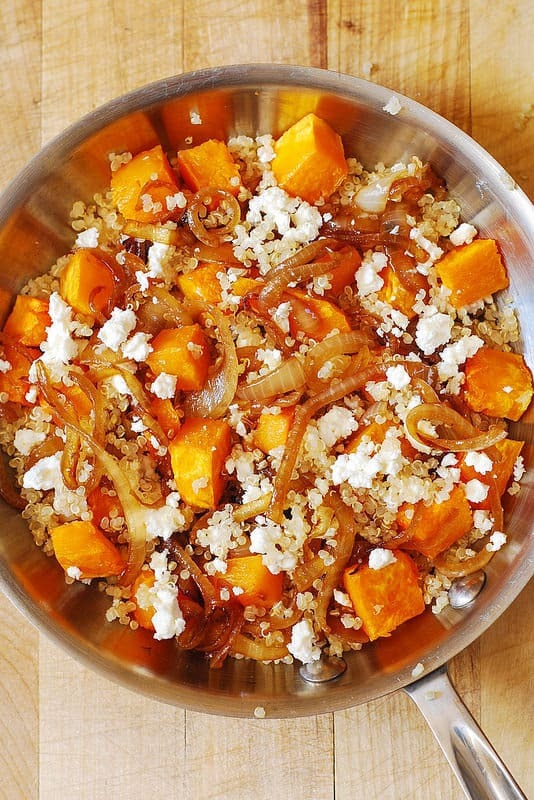 In a large bowl, combine cooked quinoa, roasted butternut squash, caramelized onions, and mix with the dressing. 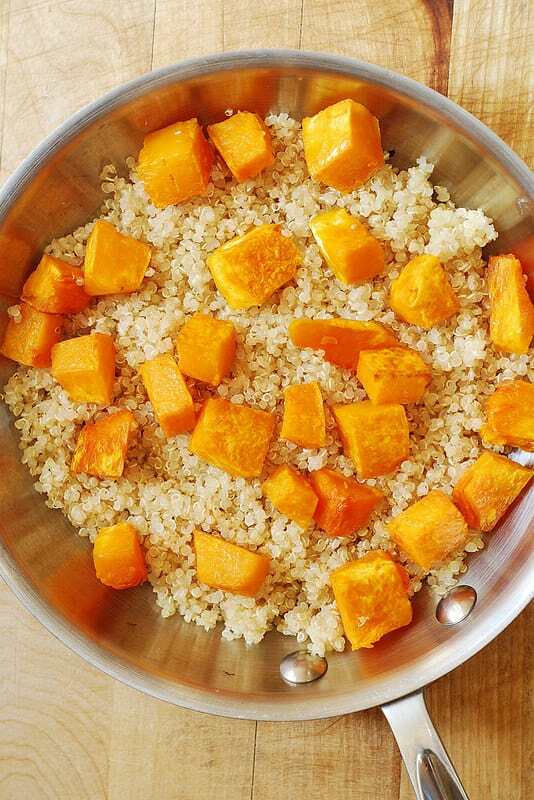 Add the dressing only before the serving, and add as much as you want to individual portions, as both quinoa and butternut squash tend to be on a dry side, and this dressing (when generously applied) fixes this beautifully! 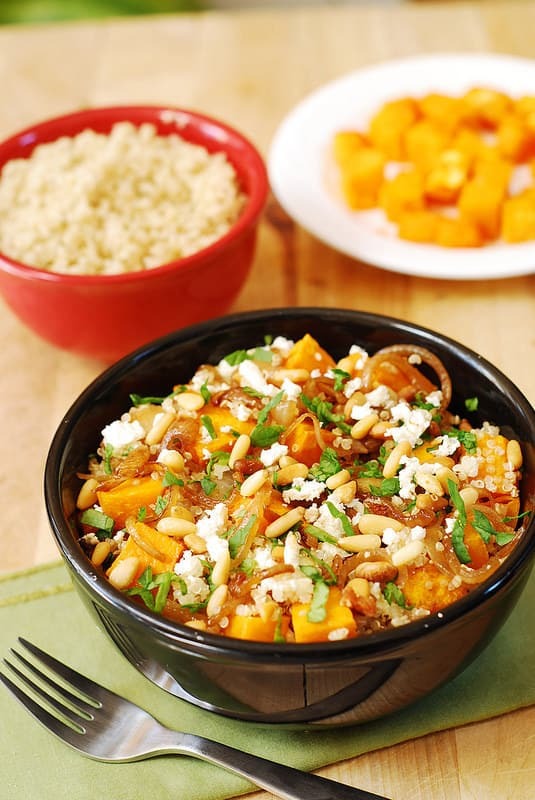 Top each individual serving of quinoa salad with Feta cheese and toasted pine nuts. Note: The quinoa salad keeps very well refrigerated for up to a week, but only without dressing. Add the dressing only before serving. I think it was finely chopped spinach. You can also use chopped parsley or cilantro. Silly question… do you eat it warm or cold?